Made in England, United Kingdom, Europe, 1890-1910. This is a vertical roller mill used for grinding grain into flour in a roller flour mill. It was made in England between 1890 and 1900 by Thomas Robinson and Son Ltd of the Railway Works, Rochdale in Lancashire. Robinsons supplied many of their roller mills to flour mills around New South Wales. This particular roller mill machinery is significant because it features vertical rather than horizontal steel rolls. A timber and steel framed roller mill used to grind wheat and other grains into flour. The two steel rolls are arranged vertically. Thomas Robinson and Son were established in Rochdale, Lancashire, in 1838 as timber merchants, joiners and carpenters. In 1882 that decided that flour milling machinery was an ideal opportunity to expand their business so with the their existing pattern shops, foundries, and fully-equipped fitting and erection shops they were at an advantage to add flour milling equipment to their list of products. In 1884 Thomas Robinson and Sons announced that they could equip a complete flour mill with their own make of machinery. Milling began at the Hamilton Flour Mills in 1900 under Peter McIntosh and Charles Shelley McIntyre. Hamilton Mill was upgraded in 1936 and 1952, sold in 1982 to Allied Mills and then later sold to Fielders Pty Ltd. This roller mill machine was thought to have been removed in 1976. The mill buildings were damaged during an earthquake in 1989 and the mill's silos were demolished. It was subsequently closed and reused. 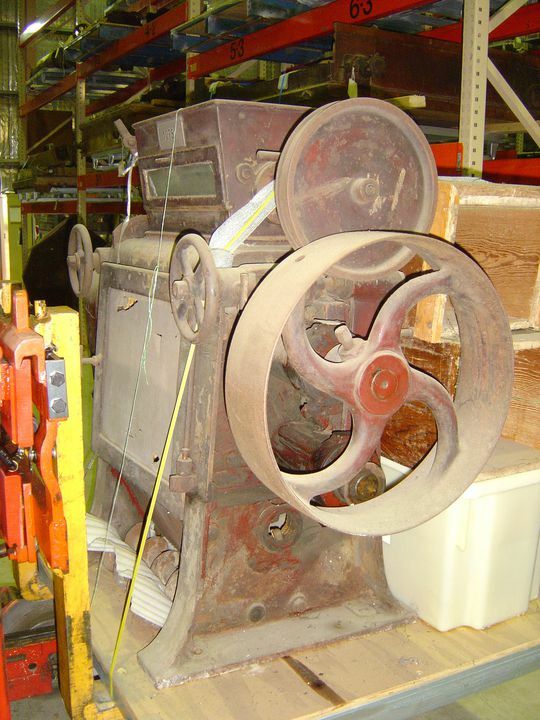 This roller mill went into the Willow Vale Milling collection at Willow Vale Mill, Laggan, New South Wales, and was acquired by the Museum in 1985.